Milk & Cookies Story Morning, Take 2: In which we learn the word "encore"
I blogged earlier this month about a new story time program I began offering in March, a Saturday morning Milk & Cookies Story Morning. My main impetus for this new program format and time was better fitting into the schedules of families who can't necessarily make a weekday story time. So far, I'd say it looks like I'm going to be successful on that front: I was averaging about 6 attendees at my previous Evening Family Story Times; the debut M&C Story Time drew in 17 people; and April's M&C Story Time had 36 people attend. Those are big jumps, and our Saturday morning story times are seeing lots of new faces. I love programs that invite new library users. Make it transmedia. I include app-based technology once in each program. This will be in the form of a book app, felt board story, or musical enhancement. Make it interactive. We roll our song cube to determine what traditional song we sing. We sing and dance to songs heavy on movement aspects. And we end with some parachute fun, which never fails to excite and engage. Include a folk or fairy tale. This goal is a newer one for me, but it's becoming more and more important. After months of visiting preschools and daycares for story time visits, I saw that many kids haven't heard the "traditional" folk and fairy tales; it seems grown-ups assume that, because they are traditional, the kids already know them. Not so, and so I'm including one at each program. Kids who have heard them before still delight in retellings. Play time is integral. There is space and time for free play after each of these programs. This story invites lots of open-ended questions about the pictures, what's happening in the story, and the topic of making friends. 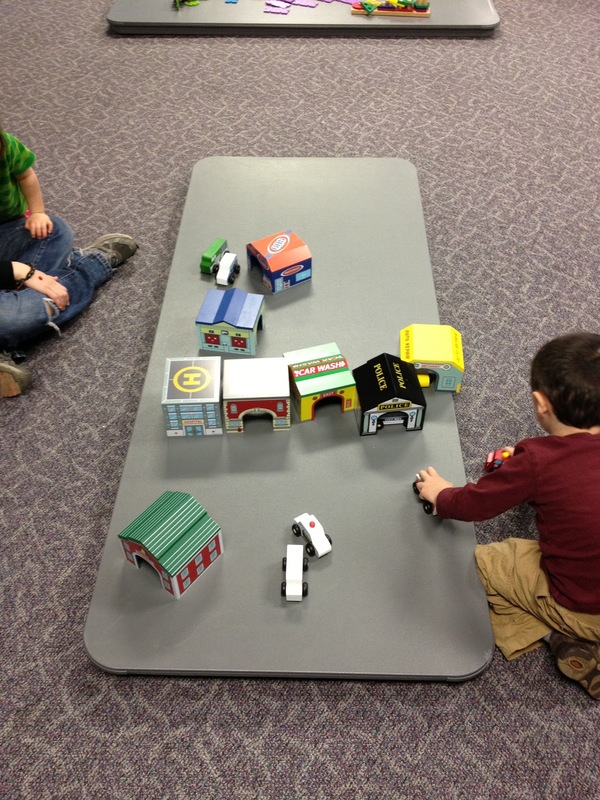 It also provides great opportunities for making animal noises and motions, a huge bonus for kids' morning energy. 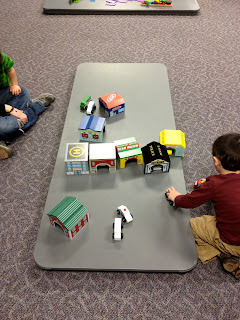 A roll of our song cube landed on "I'm a Little Teapot," so the kids and I stood up to sing and act out the song. We had a huge round of applause from the grownups afterward, and I took the opportunity to introduce the word "encore." We offered to sing another song for the grownups, who acted delighted, and we performed "I'm a Little Teapot" again. 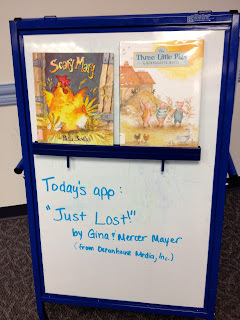 Book App: Just Lost! by Gina and Mercer Mayer from Oceanhouse Media, Inc. This wonderful Little Critter story follows Little Critter as he gets separated from his mom and siblings at the mall. Oh, no! he thinks; My mom is lost! The story follows Little Critter as he resolves to be brave, tells a grown-up that his mom is lost, and spends a little bit of time amazed at the mall security office before being reunited with his family. 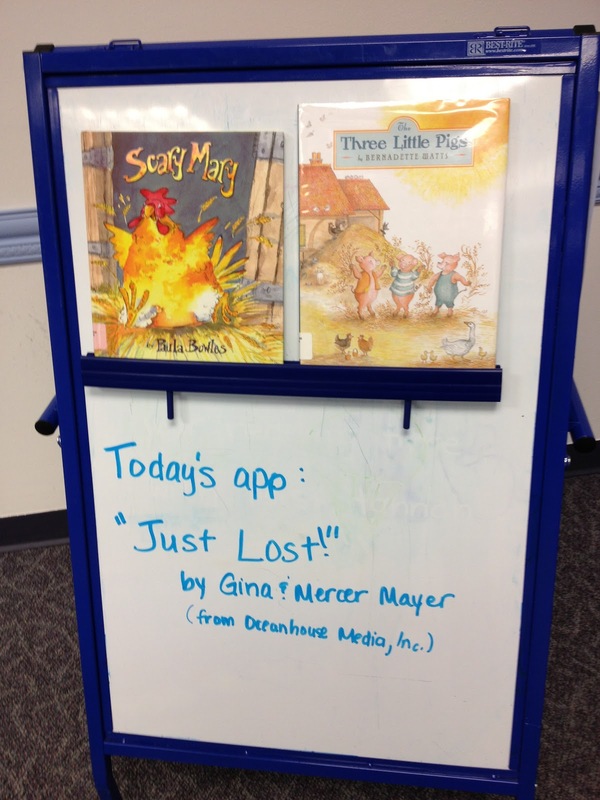 As I shared the book app with the audience (it was mirrored on our HDTV), I asked questions about what the kids could see in the pictures, what they thought would happen next, what they would do if their mom or dad got lost. I'll admit I was initially unsure if this app would be too long for the kids' attention spans, but they were totally engaged in the story. They even wanted to share their own lost stories after we were done. Once again, I was blown away by the literacy potential of sharing an app with kids in an intentional and interactive way. We had a dinosaur marching parade of sorts for this song, with many of the children opting to join the main group in a marching dino circle. A few stayed on the sidelines with their caregivers, but they were definitely stomping their feet and doing the other actions with the music. This version of the Three Pigs story offers a great intro for new listeners, with great illustrations that can get kids talking about what's happening. The wolf doesn't get cooked in the end of this version, so if that's the tale you want to tell, there are other options. I got the parachute out of the bag, and I threw on top of it three beach ball-style globes. The exercise of having fun with the parachute while trying to keep the globes on it was a great activity for concepts of teamwork. This time we had Nilla Wafers, 2% milk, and lemonade. One mother brought her own snacks for her kids due to food allergies, and I was so glad her children were able to participate in that portion of the program. I got out three tables' worth of toys again, ranging from wooden garages and cars to counting cookies and building materials. This is the portion of the program that I am most excited about--it offers great opportunities for me to interact with each child, and I can also model behavior for interacting with children as they play. This is also the time in the program when grownups can have conversations, and many of them seek out conversations with me. They ask about great apps, what programs we have coming up, what else the library offers... really, the PR potential of this free time is amazing. And all while the kids are exploring the world through free play. I know at least one other librarian, Angela in Nova Scotia, has adapted this program format for her own library customers and goals; see her version here. Anyone else including apps in programming? Offering weekend story time options? Focusing on building kids' knowledge of folk tales? I'd love to hear what you're doing. 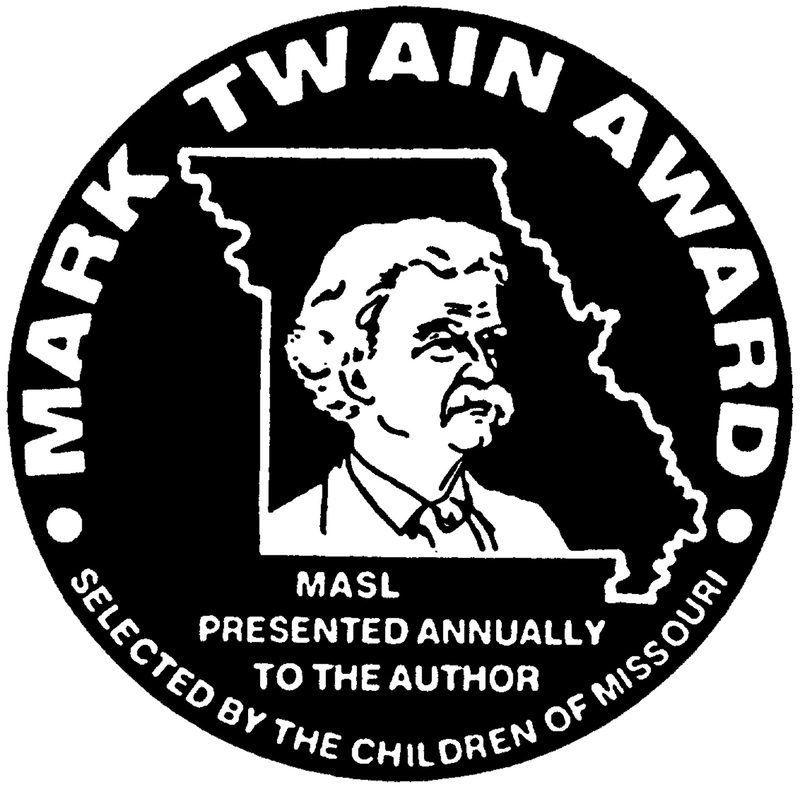 A few weeks ago, the winners of the Missouri Readers Awards were announced. 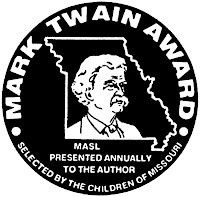 I was thrilled to learn that the 2012-2013 Mark Twain Readers Award, chosen by fourth through sixth graders, was given to Sharon M. Draper's Out of My Mind. 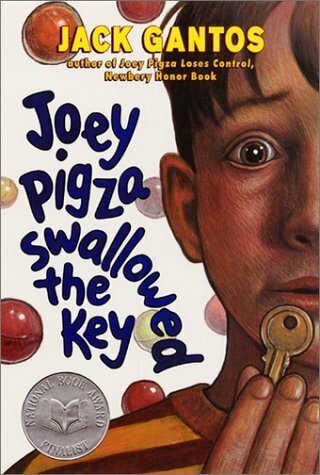 During the course of this school year, I've had lots of eager middle grade readers come talk to me about the books they were reading and enjoying, and Out of My Mind seemed to always be part of the conversation. And rightly so--this story beautifully illustrates that people are people, despite any appearances or differing levels of ability. We all want friendships, to learn and be challenged, to feel love and appreciation from our families... Simply, we're all human and want to be treated humanely, lovingly. I am ecstatic that young Missouri readers latched on to that message. 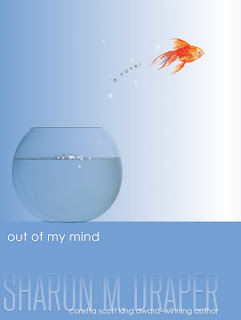 I've already had a number of kids come ask me for more books like Out of My Mind, and I anticipate many such requests over the next few weeks and into summer reading. To meet that demand--and to help my reference colleagues who don't have as much familiarity with MG titles--I have put together a list of readalikes for Out of My Mind. Brief explanations included. 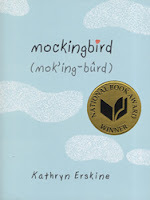 Mockingbird by Kathryn Erskine -- Told from the perspective of a young girl with an ASD, this story wonderfully shows how every person must process difficult feelings and situations in life. How we interact with the world may differ, but we're all still very much a part of it. 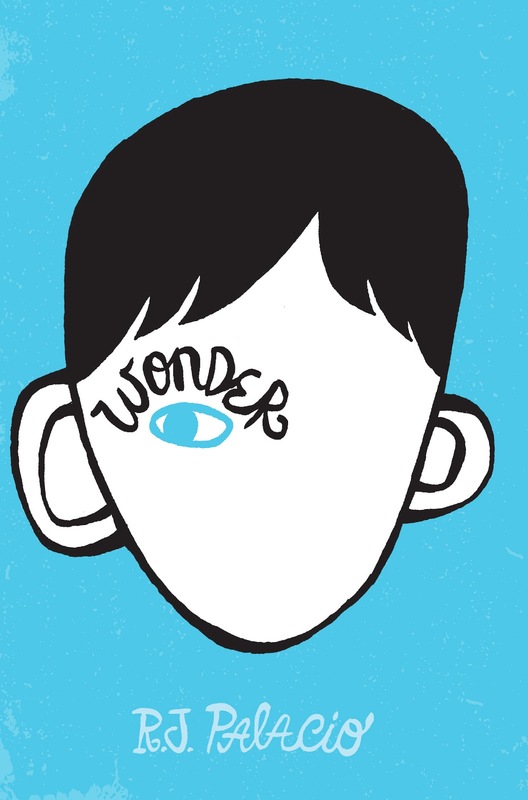 Wonder by R.J. Palacio -- This novel cannot help but inspire children to be their best selves as it follows Auggie and his classmates on his first foray into a school setting. Like Melody in Out of My Mind, Auggie's special need is visually apparent. 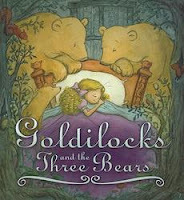 This story is told from multiple perspectives, and message that we all want a fair chance at being ourselves rings true. 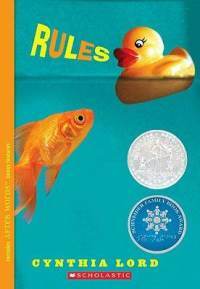 Rules by Cynthia Lord -- This slightly older title is a bit different in that it is the protagonist's younger brother who experiences life with a special need, but the impact of the protagonist's story is no less profound. The Joey Pigza Series by Jack Gantos -- Many a reader has fallen in love with the disheveled and energetic Joey Pigza who, when it comes down to it, unabashedly lives his life the way he knows how. Gotta respect that. 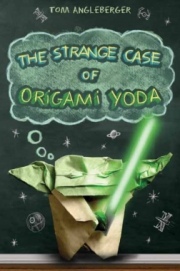 The Origami Yoda Series by Tom Angleberger -- Another example of novels told from multiple perspectives, this series subtly demonstrates that we're all different, no exceptions. One kid may be labeled the geek, another the weird one, another the bad attitude kid; but while these differences may distinguish us, they do not define us. 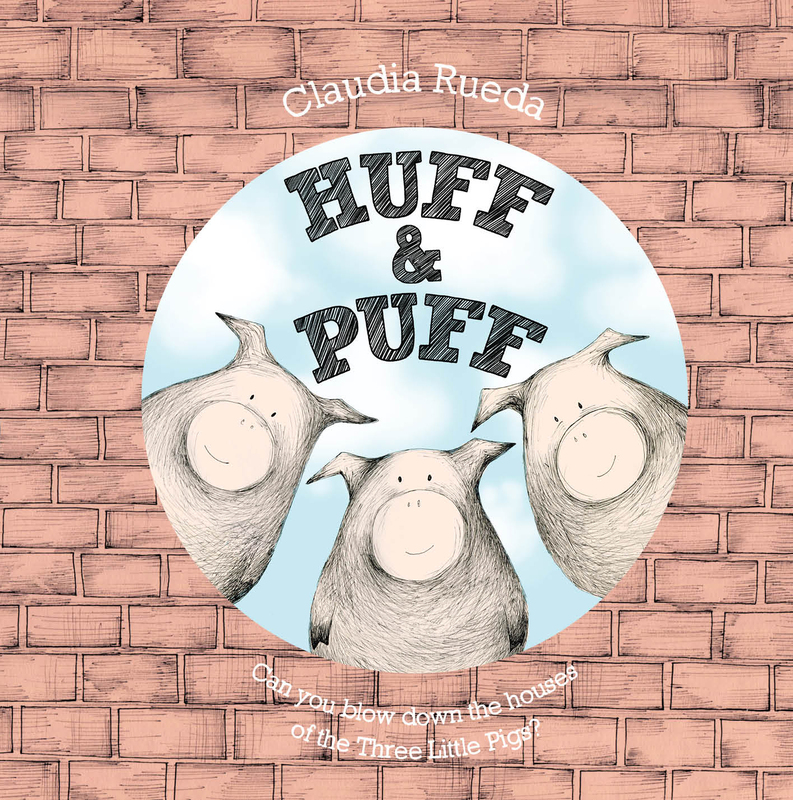 There are so many characters in these books for kids to love and commiserate with. What titles would you add to this readalike list? What books won state awards this year in your neck of the woods? What sorts of quick readalike lists, if any, will you prepare for summer reading? Have you ever noticed how outreach visits to preschools and daycares can take you entirely by surprise? Even after a month of taking the same bag of stories and songs out to child care centers, each individual classroom visit has risks. What if the kids have too much energy because it's been raining non-stop and they haven't gotten to run around outside? What if the teacher is so focused on every child sitting perfectly still that every third word the kiddos hear is "sit," completely obfuscating the story? What if the classroom of kids doesn't know what to do with a stranger in their midst and just stares at you despite your pleas to hear their best cow noise? I've encountered each of these situations multiple times, including a handful of instances just in the last month (such is the life of a frequent outreacher). And do you know what I've found to be almost 100% effective in each of these problem scenarios? Interactive story time elements. For me, interactive story time elements are the program parts that I can quickly adapt depending on my audience. For each element, I have a book as well as a more participatory activity. We can do one or the other to suit the mood of the group, and we can do both if the audience really likes a particular story. They all have the potential to get kids wiggling constructively, engaging in literacy, and having fun, all while behaving according to the "rules" of the library lady. Ta-da! 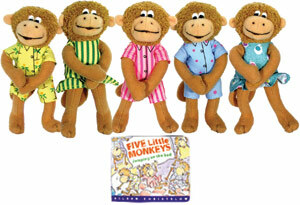 Five Little Monkeys Jumping on the Bed - This favorite fingerplay of childhood is always a hit with my child care center groups; they love helping to count off the monkeys and jump their fingers up and down to the rhythm of the rhyme. By the end, everyone is saying in their best doctor voice: "No more monkeys jumping on the bed!" Eileen Christelow, whose five monkey ouevre can span plenty of story times on its own, also offers great read-alouds for after the kiddos have acted out the bedtime rhyme and are clamoring for more monkeys. The Three Little Pigs - I have something of a personal crusade to make sure all kids get to kindergarten with knowledge of the core folk and fairy tales. The Three Little Pigs is certainly among those tales, and I love any opportunity to read or tell that story. For groups that are not yet familiar with the story--and there are plenty who've never heard it, trust me--I do an oral telling of the tale. 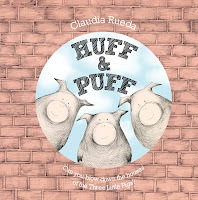 For groups that already know what happens to the pigs and the Big Bad Wolf, I jump right into Claudia Rueda's Huff & Puff, a great retelling with a twist. In this telling, the audience does the huffing and puffing, with great results in the illustrations. I don't want to ruin the final surprise; check it out and give it a shot. 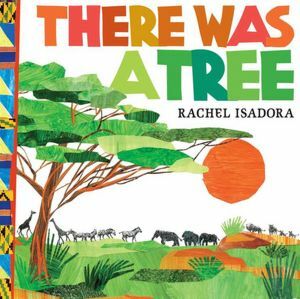 There Was a Tree - I remember singing some version of this cumulative song from my grade school days, and I encountered a few different versions at summer camp. Regardless of the song's origins, it's lots of fun to share with preschoolers. 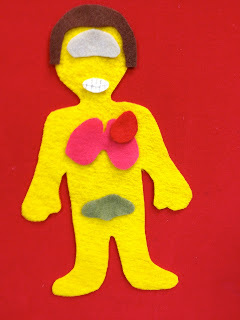 I've done it three ways: entirely sung, while I play the ukulele; sung with the help of felt pieces as visual clues; and read via the version illustrated by Rachel Isadora. By the end of any of these tellings, the children are in stitches of laughter as a result of the downhill-effect speed of the last verse: "Oh, the bug on the wing, and the wing on the chick, and the chick from the egg, and the egg in the nest, and the nest on the branch, and the branch on the tree, and the tree in the hole, and the hole in the ground, and the green grass grew all around and around, and the green grass grew all around." Whew! What are some of your favorite interactive elements to take to outreach story times, where the crowd can vary? I like to offer some sort of library program that ties in with National Poetry Month each April. This year, in an attempt to attract more kids to the program, I decided to tie together two creative mediums: poetry and art. What follows are details of the resulting program, Pop Art Poetry. When I opened up the program room for the attendees (twice as many as last year--improvement! ), the children were able to find themselves places around a big table with all our craft supplies on top. After introducing myself and learning their names, I told them that our program would combine pop art, a brightly visual type of art, and poetry. To introduce some the feel of pop art, I shared 5 images from Roy Lichtenstein, Tom Wesselmann, Wayne Thiebaud, Robert Indiana, and Andy Warhol. We briefly discussed how these artists of the Pop Art movement portrayed everyday items in new, vivid ways. We then turned to a brief poetry introduction. We talked about adjective poems--choose a noun, then choose adjectives to describe it, and voila, a poem! One girl wanted to write haikus, so we refreshed on haiku 5-7-5 format. And we also talked about onomatopoeia, those wonderful words that make the sound the represent. Armed with these poetical tools, we were ready to spend the remaining 40 minutes on our masterpieces. mixed media weight paper from the craft store, 11" x 17"
I had scrap paper and pencils for the kids to draft their poems before starting on the full "canvas," and they all took a few minutes to craft their poetry. One girl decided to do a series on the seasons; a few opted to write about pets; and one boy wrote a poem about a rainbow. 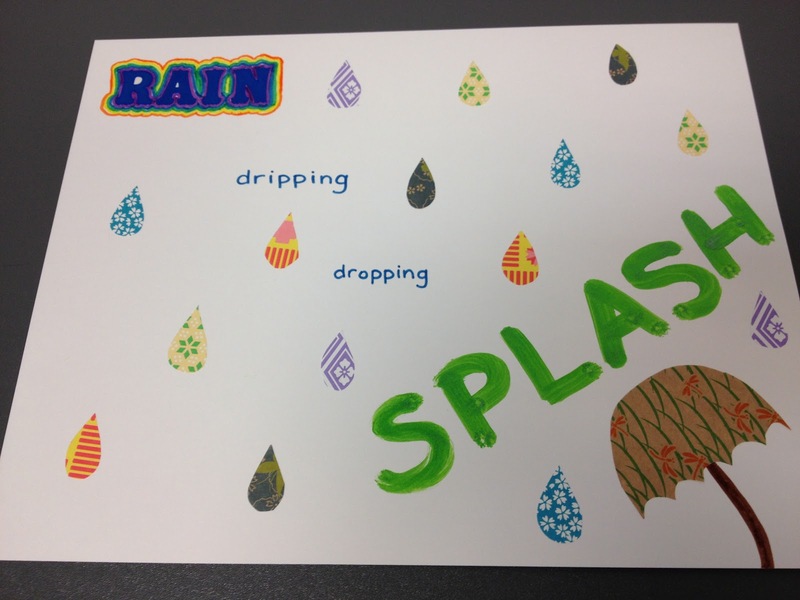 Once they were satisfied with their poems, they got to creating their pop art poems. Since this was a school-age program, the kids were very self-directed as far as working with the supplies on hand. As a result, the hands-on creative time was spent in conversation. These children were eager to talk about their favorite artists, what they'd been reading lately... Really, the conversation just flowed naturally, and the kids were able to get to know one another and have a relaxed evening at the library. 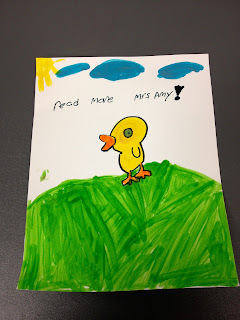 I worked in some plugs for upcoming programs at the branch, and the kids shared what they were excited about attending. The final products of the Pop Art Poetry program were brightly colored and lyrical, perfectly blending the visual and linguistic arts I hoped to combine in the program. Most of the children headed home before I had a chance to get pictures of their creations (one did create a picture for me, though), but I'll tell you what--instead of taking my word for it how great their pictures were, why don't you offer this sort of program and see for yourself what your children come up with? 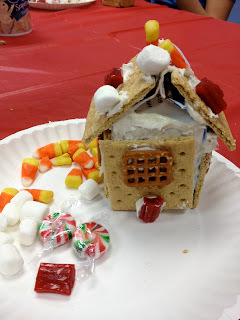 Today's guest post comes from Miss Melanie, a children's staffer at my library. She is sharing a terrifically fun and engaging STEAM program that she offered during our school district's spring break. Take it away, Miss Melanie! 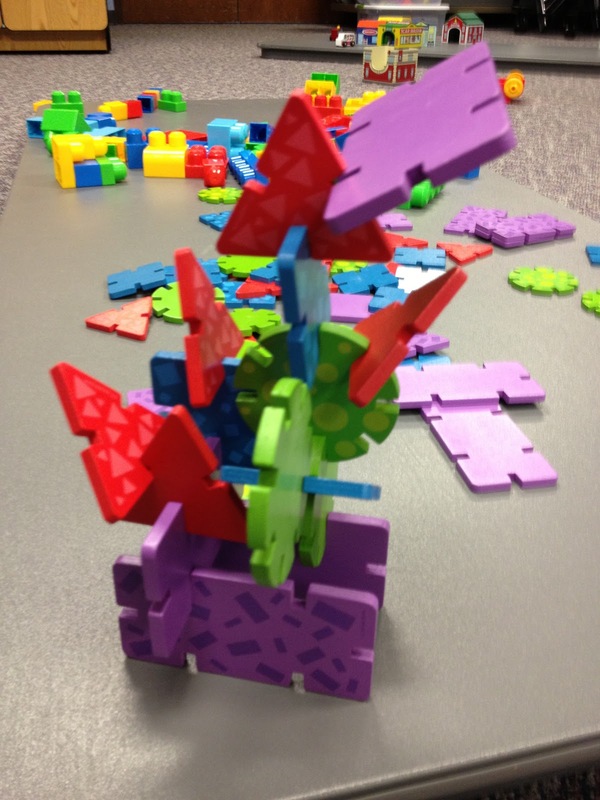 My idea for a recent children’s Science Technology Engineering Arts Mathematics (STEAM) library program evolved after cleaning up from a Time for Twos program and pondering the “likes” of children. In tipping a long table on its end, a toy train engine left by a child zoomed down the table and crashed to the floor. I couldn’t resist. I did it again. Tip, roll, crash. Tip, roll, crash. Fun! I remember thinking, I can use this, and tucked it away in the recesses of my brain. Weeks later I’m pondering what type of program will accomplish STEAM goals with 20+ rambunctious children during their spring break. Call me a geek, but I will sometimes web diagram my thoughts. Speed, tape, movement, tubes, building, create, pipe cleaners, noise, and cutting were just some of the many words I wrote on my web. What would my own kids like? Aha! 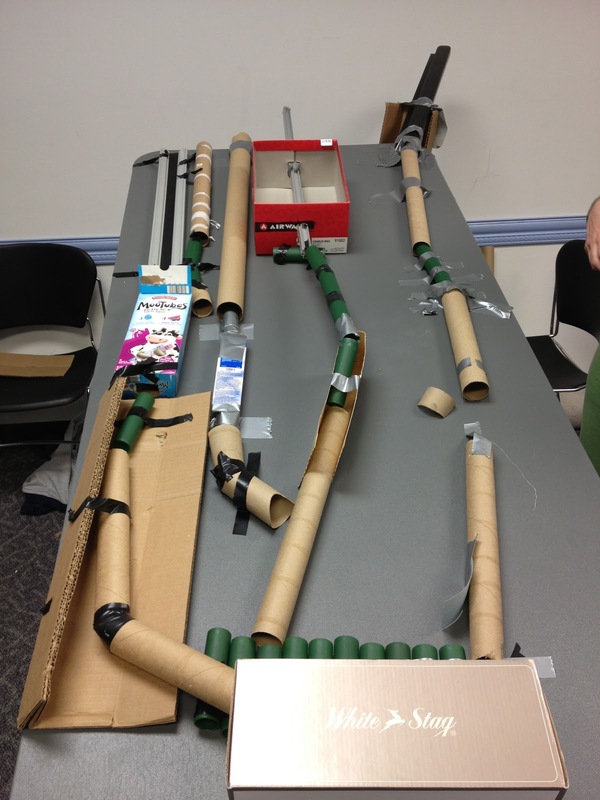 The Marble Run Mania idea was born. With supportive co-workers who will collect anything for me, one trip to Leftovers, Etc. (a not-for-profit creative and educational resource facility), and a few consumables (electrical and duct tape, pipe cleaners) the program was literally ready to roll...out the marbles. On the day of the event, I displayed all the possible products collected for building marble runs. I placed three long tables end to end, piled with recyclables: paper towel/gift wrapping and paper/plastic/pvc tubes; egg cartons, binder clips, pipe cleaners, milk jugs with holes in the bottoms, detergent lids; and some unusual parts of things like the broken frame around a felt board, creating a straight track. Anticipating around 30 kids, I set up six stations by tipping six tables. One set of legs was resting on the floor; the other set was placed in two chairs to create a slant. Remember the train zooming down the table? Voila! 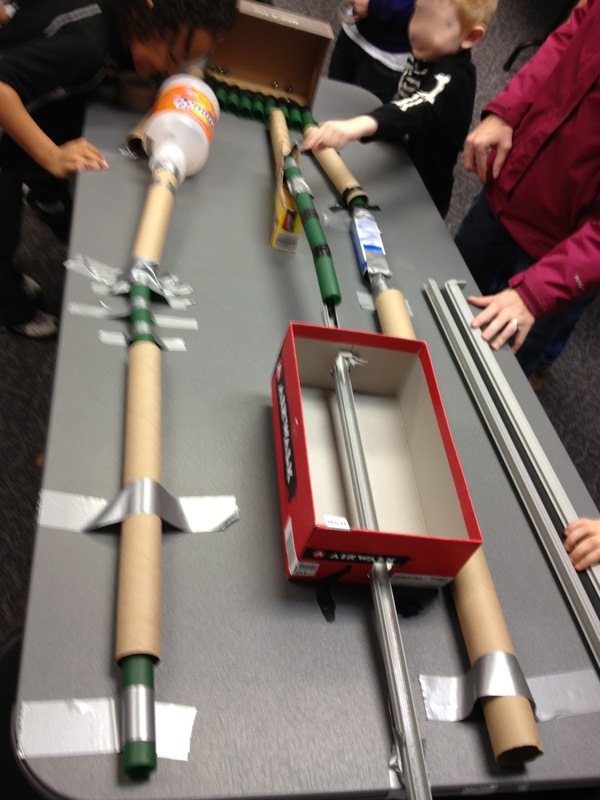 Our marble runs would be constructed against the slanted table top so the force of gravity would be in our favor. Each group was allotted a supply of tape, scissors, and other consumables. As the children entered the room, a teen volunteer handed them a shoebox with a marble in it. I wanted to get the “juices” flowing for the project so I prompted the children with several questions: Keeping the marble in the box, what can you do with it? See how it rolls? What makes it roll? Can you make it touch all four sides with and without it rolling along the edges of the box? What else can you do with it? Once the majority of the group arrived, I polled them for their background knowledge of marble runs. To create our own runs, I demonstrated how we would use the slanted tables to assist us with creating a run to finalize at an end point. I used duct tape to tape a paper towel tube to the table to show the marble running through it. What is a deflector and what does it do? What recyclables would make a good deflector? The kids were divided into groups roughly by age unless they came as their own group. To provide some structure and a starting point, I suggested they start at the highest point of their table and choose something the marble could shoot through. Paper towel rolls were the first to go, and kids got the hang of the taping quite quickly. Back and forth to the product tables they went, choosing just the right object for the next link in their run. Teen volunteers assisted with tape ripping, holding parts in place, and making themselves available on all fronts. They did an excellent job of allowing the youths to create and implement without overtaking the project. I asked the teens to prompt kids with open-ended questions if the kids fell stuck on a part. Again, the teen volunteers were found encouraging and asking, "What would work best next?" While navigating around the room, I incorporated as many scientific terms as I could into their building process without sounding preachy. "I see you chose the milk jug lid as a deflector. The marble richochets into the tube. Cool. What happens when you add another deflector? Tell me about this part. I see the marble runs slowly through that part? Why? What would increase the speed of the marble?" I used terms such as gravity, weight, launch, roll, bump, drop, bounce, heavy, and force. I was genuinely interested in their processes. Many groups found challenges along the way. Why won’t the marble go through? Was the opening too small? Was there an obstruction? Was tape sticking to the marble? The tape won’t work. 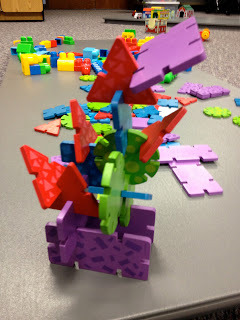 They aligned tunnels, made long drops, plunked marbles, re-aligned, and finally--success! Some decided to add on or make another branch to the run. Others made a whole new run next to the original. The diversity of the marble runs was amazing. One child continued to attach paper towel tubes together well past his own station and into the next. Some, with the help of a parent, made various chambers like in pinball machines. Tape was used in abundance. 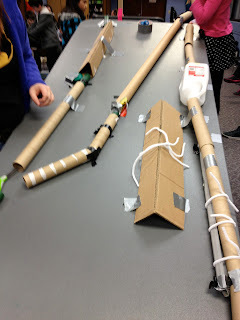 We spent the last minutes eagerly making our way around the room trying each other’s marble runs. Kids whose parents hadn’t been building with them proudly gave their parents marbles to drop down lengthy chutes, explaining what they did and watching the marble finally plop into the end container. The final attendance count was 58, and overall I was pleased with the results of the build. I will modify a few things for next time: prior to the build, I’ll have the teen volunteers build a marble run made of completely different materials than what the kids will be building with; providing more types of tubing materials; and starting my collecting earlier. Also, dismantling runs at the end by the teen volunteers and myself was time consuming, but well worth the effort. We were able to salvage some things... to be used for the next builds. I’d also inspire groups to create a name for their building teams and to create a name for their marble run. I can’t wait to do this again! My branch library has had a thriving Teen Advisory Board for years. I think our group is perennially successful for multiple reasons: it provides teens an outlet for socialization; it recognizes that kids from different schools, clubs, and cliques may have something larger in common; and it allows teens a chance to carve out a meaningful space in their community. TAB is great. So, of course, I wanted one for my kids. This spring, I advertised a new Kids Advisory Board program for children between the ages of 10 and 12 (they have specifically asked that I not call them "tweens," a word they dislike) and put out some flyers with the mention of snacks in hopes of drawing some attention. I also personally invited many of the pre-teens I see in the library often. I know that any new type of program is going to take some time to gain attendees, so I wasn't unhappy with the turnout at our inaugural meeting earlier this month. There were three pre-teens seated around the table with me, and they were definitely excited to be the "founding members" of the Kids Advisory Board. They were so excited and chatty, in fact, that I didn't need to break out the icebreaker game I had planned; instead, they all bonded over the fact that they all have retainers. Retainers! Gosh, I love my job. Programming -- I was frank about wanting the KAB members' opinions about programs; what they like, what they want to see, themes they would enjoy. As a direct result of their advice and enthusiasm, I'm going to work on securing a live animal presenter as well as offering a Percy Jackson program over the summer. 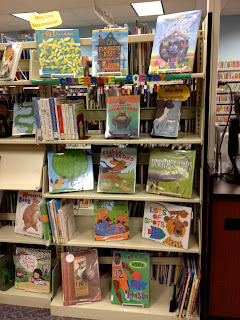 Service -- I want kids to be actively involved in the library so that they feel they have pride and ownership in the space and what happens in it. During this first meeting, we talked about what service projects might look like. Next month the KAB members will help create a matching game for our summer reading kick-off party, and after that we'll look at projects to support our early literacy programs. Reading -- These kids are voracious readers, and they love to talk about what they're reading. Since I was surrounded by such enthusiastic readers, I mentioned my Newbery position and that I would love to hear what they think about any 2013 books they read. I was amazed at how thrilled these kids were at the prospect of helping me understand how kids are responding to books. As we finished up talking about reading and book discussion, the tornado sirens went off, which meant everyone in the library joined us in the room where we were having our meeting. Thus ended our first Kids Advisory Board meeting. 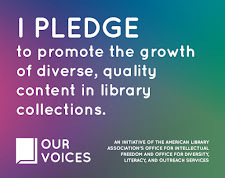 I look forward to seeing how conversations, motivations, and friendships develop over the coming months as we continue to meet; I hope that our founding members keep participating and bring other library-loving friends into the mix. Mostly, I hope that these kids will feel like the library is a place specifically for them, where they can be themselves and be a part of something, perhaps for the first time, that doesn't involve their moms or dads. I'll keep you posted. I'm on the ALSC Blog today sharing the details of my most recent Preschool Science program, Body Science. The bulk of the afternoon at SLJ's Think Tank was spent in conversation about the topics most of interest to the youth librarians in attendance. The intrepid Kiera Parrott of the Darien Library used her experience running the KidLibCamp unconference to get attendees talking about topics like outreach, services to youth with special needs, and maker spaces. I was thrilled to be part of the "Readers, Thinkers, Makers: Innovative Programs for Kids (and their Families)" conversation, where the programming ideas were absolutely flying. 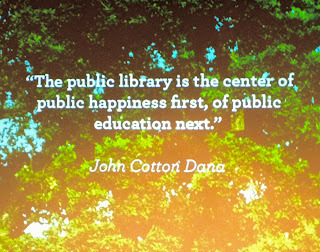 I want to share the great ideas coming from libraries all over the country. If I've failed to attribute a program you shared, please set me to rights--I'm awful with names, and ideas were coming so fast I wasn't able to reliably take down who's doing what. Stuffed Animal Sleepovers -- some librarians create slideshows of the animals spending the night at the library, and some create videos; a great tip is to tell children what books were their stuffed friends' favorites--they're almost guaranteed to check them out! Whew! That's a lot of information! What would you add to the lists? Let's get programming! I was able to participate in the first SLJ Public Library Leadership Think Tank in New York City. The one-day event, according to SLJ's Editor-in-Chief Rebecca T. Miller, aimed to serve as a lightning strike--a meaningful influx of energy and ideas for the librarians gathered from all over the country. I've been recapping my takeaways from the conference in a series of posts; see my first post, on Pam Sandlian Smith's charge to foster a culture of optimism, as well as my post inspired by the conversations on collaboration. A few times each school year, high schoolers in our community come to the library in pursuit of short stories; their English classes require them to read, analyze, and write about a short story by an author they do not read in class. Thus I am always on the lookout for short story collections that will a) appeal to teens, and b) provide ample fodder for textual analysis. I think Sightings: Stories by B.J. Hollars provides both appeal and substance. 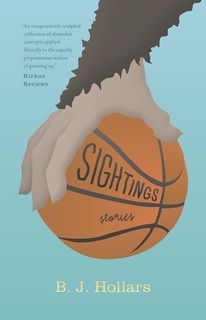 Sightings is a collection of ten short stories, all of which loosely touch on those life experiences that prove to be very meaningful after the fact--the watershed moments when we realize something about how the world works. Hollars writes about the year Sasquatch played for the high school basketball team; a father's obsession with the pioneer past of his forebears, which embarrasses his young son; and the summer new neighbors shook things up in the neighborhood. All of the stories are vividly told, and as a result they feel entirely relatable--I can envision teen readers thinking, "Yes! Something like that happened to me, too!" While Hollars didn't set out to write short stories for young adults, they are just as much a part of his audience as adult readers. Hollars is at his best when his stories are told from the perspective of boys on the cusp of growing up, and he deftly captures what is feels like to live through a seemingly ordinary experience--the stuff of everyday life--that ultimately becomes part of a personal mythology. "Dixie Land," the story I found most intriguing in the wholly enjoyable collection, has an air of Vonnegut to it that rings of deep, unsettling truth. Hollars provides plenty of material in these pages for both enjoyment and close reading. The review copy was provided by the publisher, Indiana University Press. I first became aware of Hollars's fantastic storytelling when we worked at the same summer camp in 2006; he remains one of my top two favorite tellers of the Buckethead legend. Collaboration is transformative when you serve the traditionally underserved. And in that process, you'll find new library customers. This idea of serving the underserved was evident in all the collaboration conversations that happened. There's Rachel Payne of the Brooklyn Public Library, who in her collaboration with the Department of Education offers school preparedness program series that have proven to draw new faces beyond her regular story time crowd. There's Nick Higgins of NYPL, who takes early literacy workshops to incarcerated parents so they can foster positive relationships with their children and so they know the library is a friendly place for them upon reentry into society. Both these librarians pursued their collaborative partnerships and programs because of the immense benefits they would bring to the organizations, an untapped population, and their communities as a whole. I think that premise--that collaboration is its most effective when it allows the collaborators to reach outside their usual demographics--is a great thought to really chew on. When do you collaborate? With whom? Why? I'll be asking myself these questions frequently as I consider potential future partnerships, and hopefully the result will be more intentional services with a broader community impact. I want to spend some time thinking about how I can work with other community groups to help the library reach people who are unaware of or are not explicitly impacted by our current range of services. Set clear responsibilities and expectations for all collaborative partners. Work, as much as possible, through face-to-face meetings to ensure clear communication. Pursue partnerships with a buddy--i.e., don't be the only representative of your library who is a part of the collaboration. That way multiple library personnel have the knowledge and know-how, and in the event one collaborator moves to new responsibilities, the partnership doesn't stall or have to start from scratch. I'm excited to share these thoughts on collaboration with colleagues within my library district--I know there are some great potential partnerships in our county waiting to be tapped. We've got a big collaborative project this summer with our county parks department, and I'm interested to see what other great services we are capable of through collaboration. I was able to participate in the first SLJ Public Library Leadership Think Tank in New York City. The one-day event, according to SLJ's Editor-in-Chief Rebecca T. Miller, aimed to serve as a lightning strike--a meaningful influx of energy and ideas for the librarians gathered from all over the country. 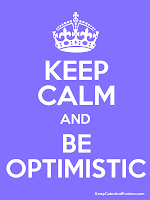 I'm recapping my takeaways from the conference in a series of posts; see my first post, on Pam Sandlian Smith's charge to foster a culture of optimism, here. Think about that statement for a moment. 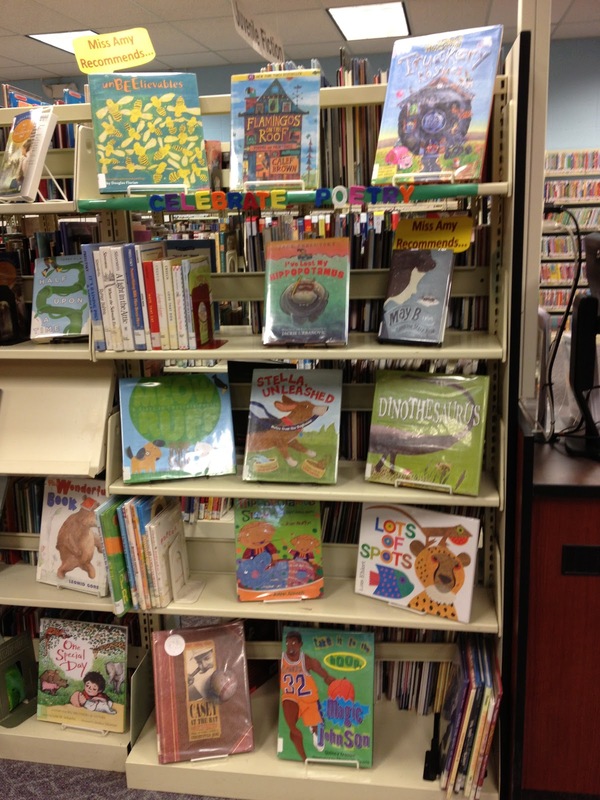 Is your library a happy place? Are customers happy when they are at the library? Are staff happy? Are you? According to Smith, the power to foster all that happiness lies with us--the staff, the librarians. We have the power to be creative and energetic in how we approach and do the work of libraries. 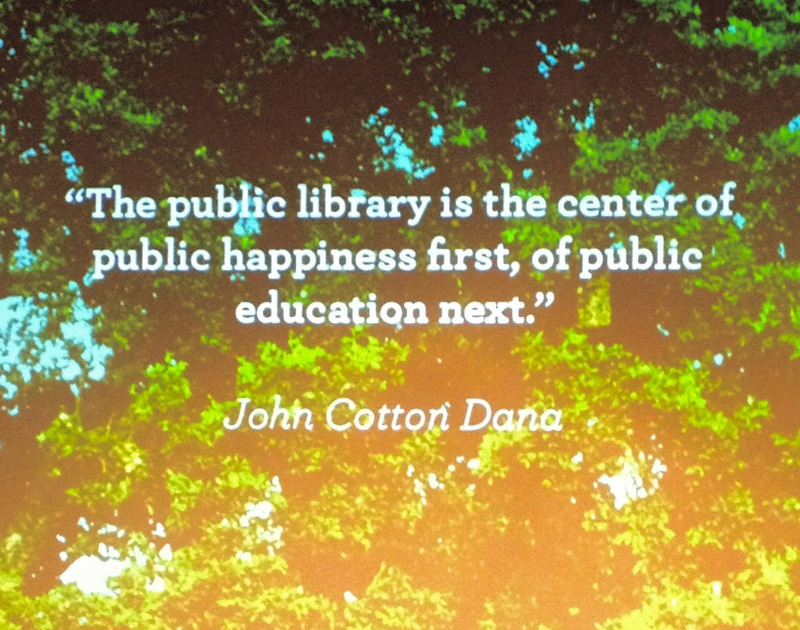 We have the power to innovate, to transform our library, both its spaces and services, into an entity that promotes public happiness in everything we do. Using that power, says Smith, fosters a culture of optimism and, ultimately, better libraries. I want to support remarkable, transformative experiences. I want the library to be an active, not a passive, place where customers from all walks of life are engaged. 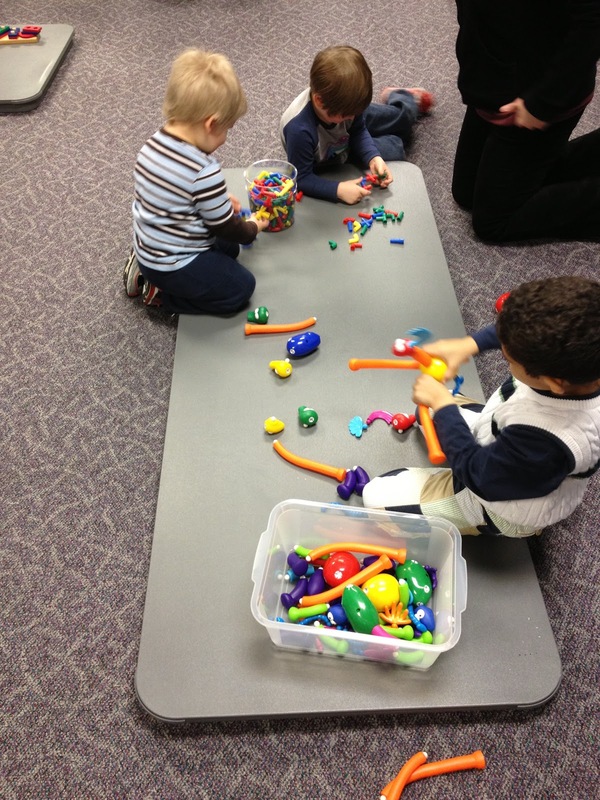 Engaged in conversation, leisure, exploration, play, discovery, story, learning... I want the library to be a place where kids (and everyone!) use their hands as well as their minds. I want to say "Yes!" Does someone have an idea? Will it further open our services to the people in our community? Let's give it a shot! I want to be the type of person who says, "That was awesome. How can we make it even better?" Innovation and keeping things fresh doesn't always mean reinventing the wheel. Sometimes it means looking at current services more deeply or from a new perspective to really mine the potential for excellence. There will be naysayers, those folks who cite a bunch of worst case scenarios as reason not to innovate or take even a tiny step off the well-trodden paths in library services. There will always be these people. Acknowledge them. But do not let them drive the bus. 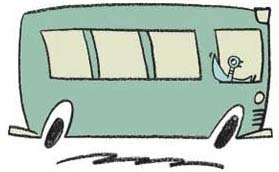 I love that: let the optimistic people drive the bus. They are the majority, and through some thoughtful work, they can continue to make the library even better. 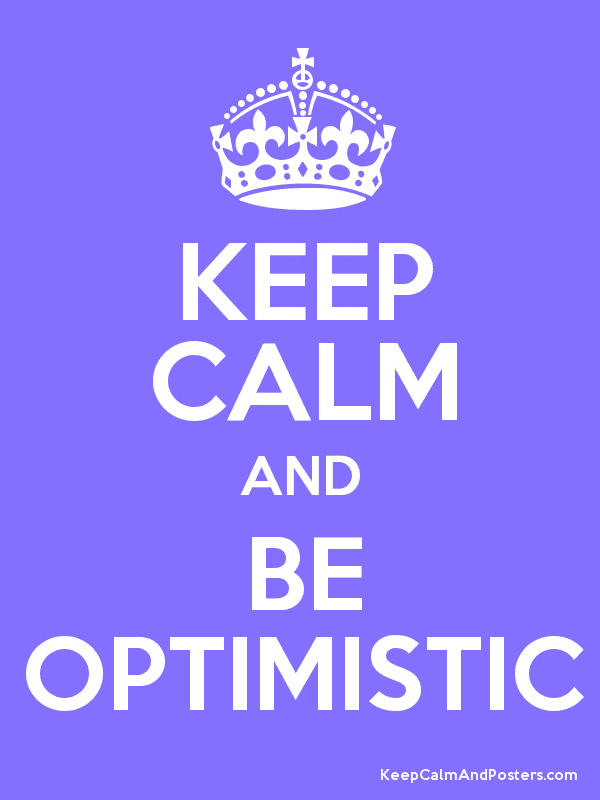 What can you do to foster a culture of optimism at your library? I am grateful that I was able to participate in the first SLJ Public Library Leadership Think Tank in New York City. The one-day event, according to SLJ's Editor-in-Chief Rebecca T. Miller, aimed to serve as a lightning strike--a meaningful influx of energy and ideas for the librarians gathered from all over the country. I'll be recapping my takeaways from the conference in a series of posts throughout the next two weeks. I'm in New York City today for School Library Journal's Public Library Leadership Think Tank. The all-day event should provide tons of inspiration for programs and services, brainstorming opportunities, and networking with colleagues from all over the country. I'll be back next week with a recap of my take-aways from the conference. How do you help your library customers celebrate Poetry Month? Any spine poems to share?